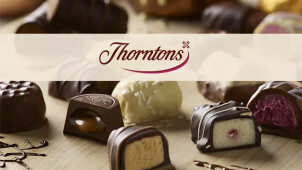 8% Off Orders at Thorntons Treat someone special, with 8% off orders at Thorntons. Free Delivery on Orders Over £35 at Thorntons Don't worry about additional charges, just grab any order from Thortons overs £35 and receive free delivery. Birthday Gifts from £3.50 at Thorntons Choose from a selection of delicious birthday gifts at Thorntons. 2 for £12 on Selected Chocolate Boxes at Thorntons Treat yourself to a Thorntons order with savings when you buy more than one chocolate box! Up to £10 Off Wedding Gifts at Thorntons With wedding season fast approaching is it the perfect time to splash the cash on a delicious gift. Next Day Delivery from £5.95 at Thorntons Get this delicious gift delivered right on time with next day delivery at Thorntons. Continental Chocolates from £3.50 at Thorntons The Continental chocolate collection at Thorntons starts from only £3.50 and is inspired by chocolate from all corners of Europe. Flower Gifts from £35 at Thorntons Flowers and chocolate, the perfect combination for any occasion! Get great deals on both at Thorntons. Thank You Gifts from £3 at Thorntons Send a chocolatey gift as a thank you, with a wide range to choose from and prices suitable for all budgets. Thorntons has been making chocolate for over 100 years, and it really shows. In 1911, travelling confectioner Joseph WIlliam Thornton opened up a sweet shop in Sheffield. Enlisting his sons Norman and Stanley, their establishment quickly became known as the best sweet shop in town. By the 1920s, they had become famous for their gorgeous creations: hand-made truffles; crystallised fondants and their renowned Thorntons special toffee. Their weird and wonderful flavours became legendary, word of their ‘Violet Cachous’, ‘Sweet Lips’ and ‘Phul-Nanas’ spread like wildfire. They were even the first chocolatiers to personalise easter eggs! By the 1970s Thorntons had over 85 shops and today they have over 230, but Thorntons still puts the same love and craft into every one of their chocolates. Using only the finest cocoa beans and tried and tested methods, Thorntons remains the UK’s number 1 chocolate shop, in store or online. Whatever the occasion, a trip to Thorntons is sure to bring the sweetest results. How do I use my Thorntons discount code? Don’t miss Thorntons special offers section, jam-packed full of great deals on sweet treats! Is there a Thorntons near me? Almost certainly! Check out their store locator here. Can I track my Thorntons order? Phone one of their customer advisors (0345 121 1911) or submit a request through the contact form here. How do I store Thorntons chocolate? In a cool dry place, away from direct sunlight. Some restrictions apply to alcohol and flower bouquets. Thorntons operates a ‘No Quibble’ exchange policy which means that, if you wish to return an item and you possess a valid receipt, they will provide a full refund, exchange or credit note. If you fancy treating yourself to some gorgeous chocolate, you could do a lot worse than popping down to Thorntons on the high street - and now online! Our Thorntons discount codes could save you money on that delicious treat you’ve been looking forward too. Their chocolate is perfect as a sharing gift or present, but we won’t judge you for keeping it to yourself. Whatever chocolate you desire, no one does it better than Thorntons. Thorntons chocolate makes for an unforgettable and delicious gift. Whether it’s bite sized truffles for an after-dinner treat, or one of their luxurious hampers for a big thank you, Thorntons’ mouth-watering range delivers the goods whatever the occasion. Their alcohol gifts are worth checking out too, giving an extra naughty kick to the chocolatey goodness. Whatever you have to say and whoever you have to say it to, a present from Thorntons is sure to go down a treat. Go one step further in your Thorntons gift and get it personalised! One of our Thorntons voucher codes could get you a personalised gift for less. These are perfect for adding an extra special touch to your gift of choice: whether it’s a chocolate model or figurine, or you want to send a specific chocolatey message, a personalised Thornton’s gift is so special the recipient won’t want to eat it (though they probably will anyway! ).